Have you ever tried to create a video from scratch? Regardless of whether it was a video guide or ‘how to’ tutorial that you wanted to create, or it may even a presentation or home movie – the important question is: How did it turn out? It is certainly possible to create videos quite easily. All you need is a device that can record video footage, and once you have that you just have to ‘point and shoot’ so to speak. However getting that video to look good is something else entirely – and that’s why having software such as Movavi Video Suite is ideal. Essentially Movavi Video Suite is a comprehensive video creation software that will give you the means to create all types of videos. If you already have the raw footage that you recorded using a digital camera or smartphone you could use that, or you could choose to capture video directly from your screen, digitize VHS tapes, grab video footage via a webcam, or create a video slideshow out of images. With so much versatility, you will be able to create exactly the kind of video that you require. For computer-based tutorials you could use screen capture, for ‘talking head’ guides you could use a webcam, and for events, home movies and so on you could use footage from a digital camera, VHS tape, or smartphone. Suffice to say – you have all the options you need when making videos. Cutting the video into segments to remove unwanted parts and merge clips together in the sequence required. Enhance the quality of the video either automatically or manually and fix common issues such as shaky, pixelated, or blurry video segments. Add customizable text to create unique-looking captions, watermarks, subtitles, or titles. Apply special effects, filters, and animated transitions to alter the visual appearance and style of the video. Include audio tracks for background music or voiceovers. By the time you’re done, your video should have the final touches that will make it look as though it has been professionally produced and edited. 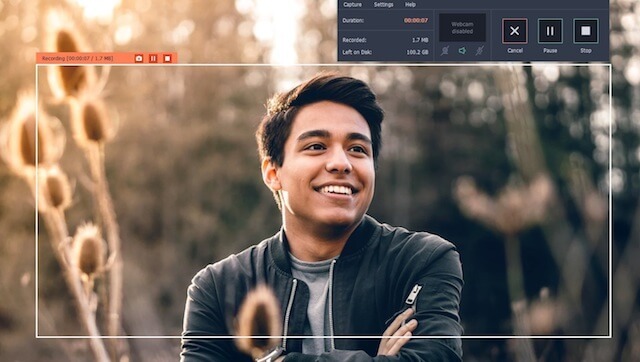 Because Movavi Video Suite is so intuitive, it won’t take you long to master its features – and apply them to good effect on the very next video you want to create.